A slender young woodsman, barely more than a girl. 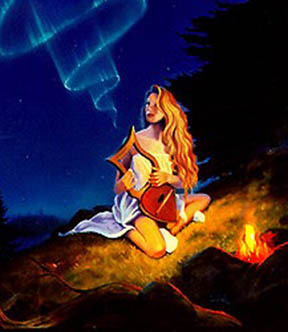 She is never without her fine bow and quiver (with which she is highly skilled) or her bulky pack that carries her precious beaten and worn harp. She would have the makings of a true bard, were she not so painfully shy. Her reticence to speak to others does not extend to elves, however, whom she will befriend readily, even showing perhaps a protective nature toward them.